That's right! With episode 5 of Beginners Fab, I've already reached a couple of mile-stones. And here they are. With episode 5 we see the finish of the Daihatsu Factory Bumper Retrofit. From now on, Beginners Fab viewers can consider it finished. So, our first project together has come to a conclusion! Still, I hope that this is only the FIRST of many projects to come. It can be, if you decide to hang around. I have plenty more planned, and they're not as simple as the bumper retrofit. Now, we get into more aggressive and interesting territory. Episode 5 is the first full HD episode that I have put together. It's never been about the equipment. I've had it the whole time. It's always been about trying to work out the logistics of being the director, actor, producer, and editor all at the same time. Plus, I'm trying to keep my cameras out of harms way. So, get ready, from now on, we are coming at you in hd for those who choose to view my work in all of it's brilliance (the little there is). Episode 5 marks the beginning of another Beginners Fab change that I think many will like. From now on, Beginners Fab is working on producing 2 versions of each episode. One version is going to be a LONG version. Much like the versions that you all have been seeing from the beginning. A second version will be the SHORT version, and this is where I'm going to change things up. 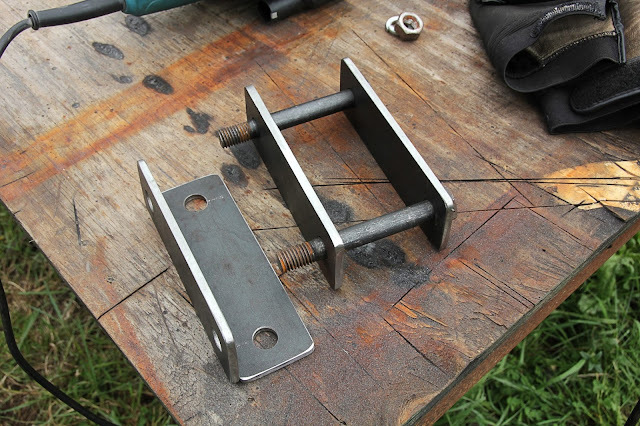 While I started this blog and videos primarily to help motivate those who wanted to get started in fabrication but thought, maybe they didn't have the tools, or the skills, to get started, it seems to be going beyond that. So, I'm going to try and accommodate two groups with my videos. With my LONG episodes, I will be focusing on more of the details in how I'm working thru the project. These will include the pre-fabrication work such as design theory and materials list planning. I'll also go over my tools used and some safety factors to consider. In some cases explaining why certain decisions or changes were made will also be included. Because of the detail that I am trying to include, there will more likely be more releases of LONG episodes than SHORT ones. Beginners Fab's short episodes will be a concise episode of the major actions taken or work preformed, allowing the viewer to see what I have accomplished but with less explanation, and therefore allowing the viewer to view the overall project more visually and in a shorter time frame. My hope is, that by implementing these new features, I will be able to help motivate and teach a wider range of people. Remember, Beginners Fab isn't so much about just the technique, but more about the ideas, motivation, and theory of fabrication. I know that there are better welders, and fabricators with more experience out there. So, as I have to opportunity to share with my readers and viewers helpful information from such people, I will. Thanks for being a part of Beginners Fab's first full project! I really hope you hang around for more. Here is Episode 5's LONG version.